Justine Williams PT, DPT is a graduate from the University of Florida in Gainesville, FL where she obtained a Bachelor in Science in Health Education. She then attended Howard University in Washington, DC where she obtained her Doctorate of Physical Therapy. After completing her specialty clinic in Women's Health physical therapy, a passion arose in her to pursue Pelvic Floor and Women's Health PT. With her experience in pediatrics, inpatient therapy, and geriatrics, Dr. Williams is able to relate to and effectively treat all ages and genders. She is currently over half way through earning her certificate of achievement in pregnancy and postpartum (CAPP-OB) and certificate of achievement in pelvic physical therapy (CAPP-PP) from the American Physical Therapy Association. Justine has dedicated her time and efforts to ensure her patients receive the best care and is committed to expanding women's health physical therapy in the Florida Gulf Coast. Dr. Williams is a residing Pensacola, Florida native. Read Dr. Jus’s feature in the Pensacola News Journal! Listen to Dr. Jus’s interview on Business RadioX! Need a women's health speaker for your next event? Through motivational speaking and her latest book, "When Comfort Can't Keep You," Justine has dedicated her life to ensuring that others, especially women, are aware that there are ways to combat anxiety, depression, fight negative emotions, and live a life of freedom. These issues significantly impact the population that is impacted by pelvic floor dysfunction. 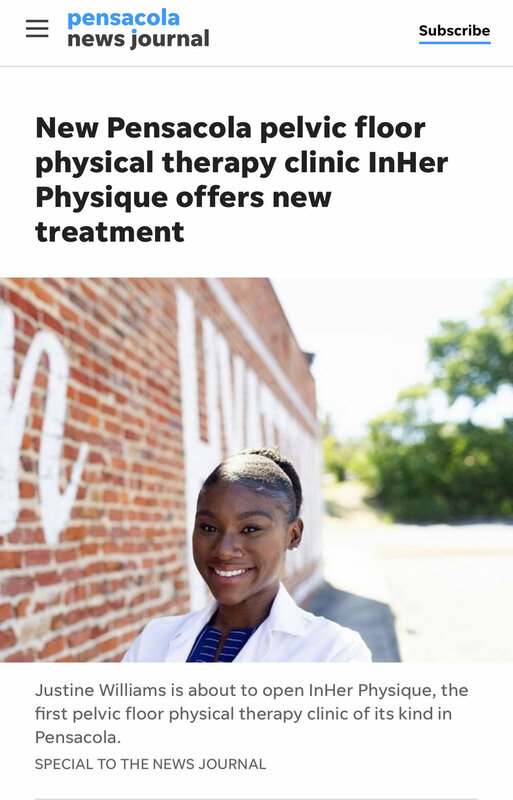 While motivating and pushing individuals to find the strength that lives within, she hopes to combine these ideals with the art of physical therapy to impact the lives of those in need. Dr. Williams is available to speak at a variety of events including women's health summits, church conferences, health fairs, and more. Pre-Order "When Comfort Can't Keep You"